Figure sets these days now come in one of two options: sets of four to six figures which are not really compatible for use in a single vignette or model (e.g. “four guys in a box”), and sets that make up a dedicated vignette or diorama centerpiece. This set is one of the latter types. 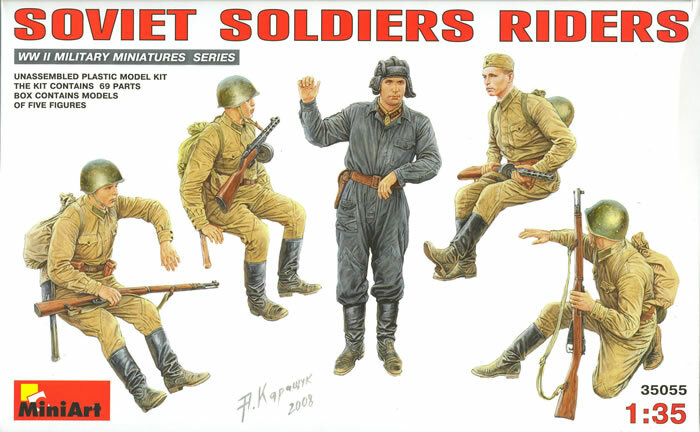 The set provides a relaxed tank commander in his hatch and four infantry riders sitting in various poses on the tank (probably best if it is a T-34 or T-34-85 based on the geometry of their legs). Each one uses traditional breakdowns of six basic parts (head, torso, arms and legs) and a separate headgear, either a steel helmet or “pilotka” side cap. Two soldiers carry PPSh submachine guns and two Moisin-Nagant rifles. Each carries a small backpack, canteen, and entrenching tool. Three of the figures are seated in different positions and one man is kneeling with what appears to be his arm on the top of the turret. Artwork is by A. Karashchuk dated 2008 and is very well done, and also doubles as the painting guide for the kit. Color codes are given for Testors ModelMaster, Tamiya, Humbrol, Revell, Mr. Color, and just names for the colors in English and Russian. Overall another great set of figures from Miniart. NOTE: Miniart was unfortunately located in Simferapol, which is in the Crimea. At this time there is no way to predict what will happen to their product line or how badly it will be disrupted by the current situation in that area.